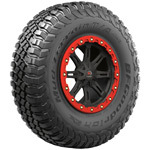 The newly available BFGoodrich® Mud-Terrain T/A® KM3 UTV tires were engineered for sport and multipurpose UTVs. Built with steel-belted radial construction and adapted from race-proven technology designed for Baja 1000-winning tires, the new UTV offerings balance maximum toughness with minimal weight. The KM3 features “Mud-Phobic” bars on the tire’s shoulders that are designed to release compacted mud for enhanced traction in muddy or soft soil conditions. The tire’s Terrain-Attack tread pattern includes massive tread blocks designed to deliver incredible grip from any angle of approach. The UTV-specific tread compound in the KM3 is designed to deliver enhanced grip on rock and other slick surfaces. The tire’s Linear Flex Zone allows it to envelop objects at reduced inflation for even more grip when climbing. The Traction-Armor Sidewall Sculpture and notched shoulder design also boost traction capabilities in soft soil and mud. The BFG KM3 was designed to conquer the toughest off-road challenges with extreme sidewall protection, pinch shock resistance and chip-and-tear resistance on gravel. BFGoodrich KM3 UTV tires are for off-road use and are not DOT-approved for use on public roads. Stable Tread Blocks deliver grip at any angle.